The heat of summer can be tough on plants. 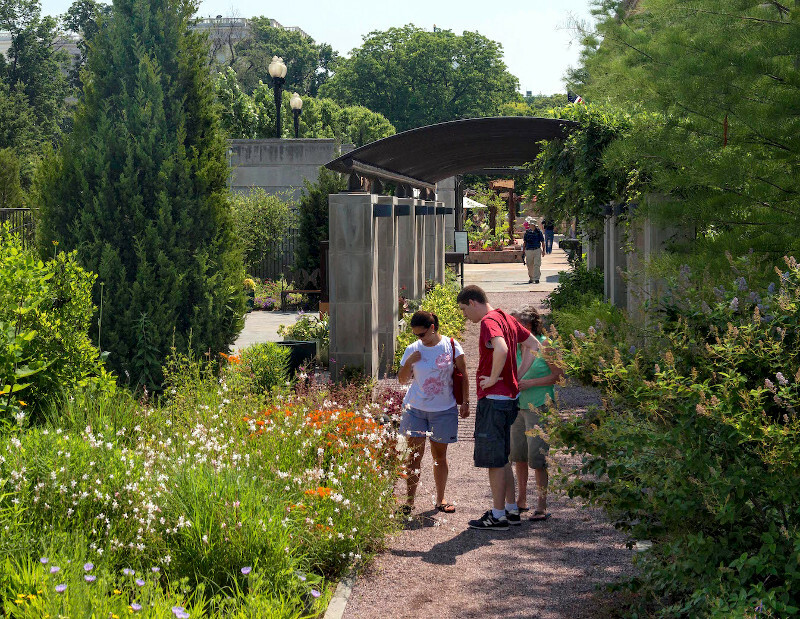 But you can use a few tips from the United States Botanic Garden (USBG) to plan, plant and care for a great garden through the long summer days. Before planting your garden do your research. Washington, D.C., for example, famously lies on the dividing line for successfully growing cool climate lilacs (best to the north and west of town) and crepe myrtles (to the south and east). Get to know your temperature zones and choose appropriate plants. The National Garden of the USBG features native plants from the nearby Piedmont and Atlantic Coastal Plain, rather than the mountains. Successful plants will withstand our hot summer nights. For example, plants with U.S. Department of Agriculture (USDA) cold hardiness ratings that don't reach beyond zone 7 (Washington, D.C.'s location) are usually not going to beat the heat in D.C.
Map graphic courtesy of the USDA. The American Horticultural Society also has a heat zone rating system and map. When you're ready to find plants native to your area, these two tools can help you find native plants by your ZIP code: wildflower.org/plants and newenglandwild.org/grow. 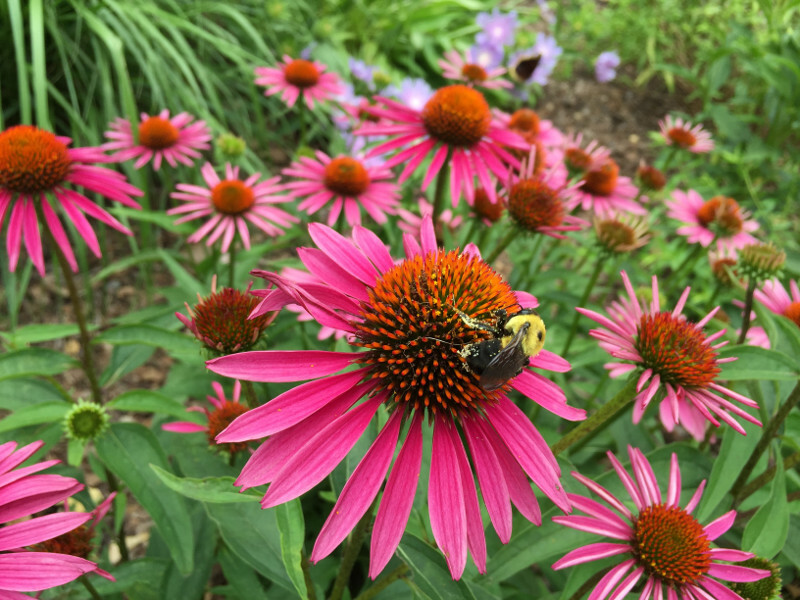 Coneflowers (Echinacea pupurea 'Pica Bella') and a bee in the USBG National Garden. Mulch! 1-2 inches of mulch prevents weeds, slows water loss from the soil and keeps roots cooler. Don't pile mulch right up to tree trunks or perennial base though, they need to stay dry. Group water-loving plants close to a convenient water source, and choose drought tolerant plants for the bulk of your garden. Keep newly planted plants from wilting as they establish by using a foliar spray of an anti-transpirant (e.g., Wilt Pruf™) which can help keep water stress to a minimum. Plant hardy species in fall or early spring so that they establish deep roots before those summer droughts hit. Find lots of tips for sustainable home gardening at www.landscapeforlife.org. Remember our pollinator friends. Some pollinator-friendly plants can handle lots of sun and heat, and provide much-needed sources of food and shelter for those animals, too. Explore pollinator plant tips at pollinator.org, the Lady Bird Johnson Wildflower Center or the Xerces Society. Think small! Another way to conserve water and make summer plant care more manageable – window boxes can be great little gardens. Incorporate fountains, ponds and other water features that can add a soothing, cool sound and also provide a source of water for birds and other garden animals. Tourists explore the USBG National Garden. Just like us, plants need special care in the extreme heat. Following the tips above will help protect your plants during the hottest days of summer. Don't care for the heat? Don't fret, cooler days will be here before you know it!